Clap your hands in welcome for former deb, Kerry Schafer. She graced these blog pages last year when her debut novel launched. Now she’s got her second book out in the world and a bunch of wisdom about this crazy publishing world under her belt. 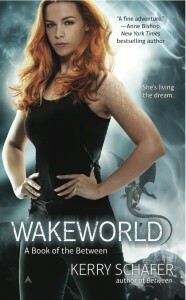 Kerry’s fantasy novel, WAKEWORLD, the second of the Books of the Between, was released on January 28th. It is a hybrid of urban and high fantasy, with adventures both in the real world and worlds of dream. It features, among other things, a dreamshifter coming to terms with her inner dragon, a wounded, sword wielding hero, dragons and swords and yes, the lethal and fearsome slime toad. Kirkus Reviews said, “[P]rose so evocative that it practically leaps off the page…enthralling and hugely enjoyable.” Yay, Kerry! 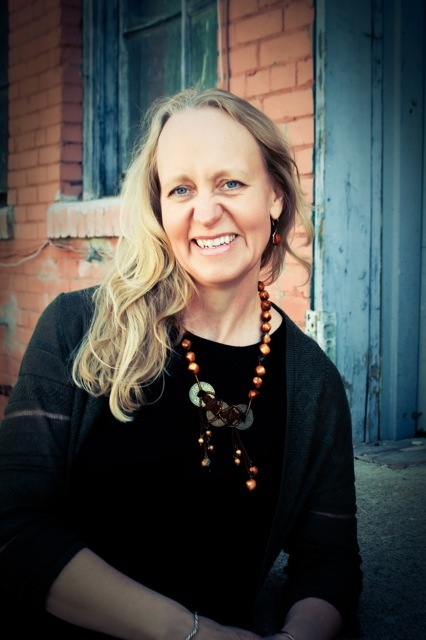 A long, long time ago, in the vast reaches of time when I was writing for the pure love of words and story, before I got swept up into this crazy world that is publishing, I had the opportunity to catch a keynote address by author Jess Walters. Jess chose to speak about success and what that means in the publishing world. It was a wonderful address, and I thought I understood what he meant. I realize now I didn’t have a clue. Of course, I can’t remember any of it word for word at this late date–I don’t have that kind of a brain–but a couple of points from his message stuck with me. There is no real success in this business. You must define your own success. It’s only now, following the release of my second book, that I truly see what he meant. When I first got the contract for my debut novel, I was on top of the world. I felt like I’d won the Lotto against all odds and expectations. Anything was not only possible but probable. I could envision movie deals and series and making enough money to quit the day job. Watching some of my writer friends obtain these things only made my expectations higher. If it could happen for them, why not for me? But I’ve been learning lessons as I go along and watching the wheel of fortune go round and round. Writers go up and writers come down. Readers abandon good writers with long standing series, and new writers take their places. People I consider successful are searching for more, or writing their collective butts off to just stay where they are. Always there is another milestone – the next book, the next series, the movie rights, the foreign rights, the bestseller lists, the top of the bestseller lists, and on and on. Even if you make those much envied lists, unless you’re at number one, somebody else will always be ahead of you. But even the most popular book doesn’t stay there forever. Some other book rises into that slot, and the author formerly at the top slides back down the mountain. So how do you ever really define success? The industry can’t define it for you, and neither can your readers or fans. Depending on family and friends for affirmation is a bad idea to start with. So what is it for you? Finishing a book? Making the bestseller list? Getting a new contract? I’m still finding my way through this. At this moment I don’t have a contract, and I’m firmly and undeniably a midlister. I struggle with the disease of wanting more, even while I see how pointless this can be. Behind every possible publishing landmark I see another one beckoning in the distance. I think it’s good to have goals and to write towards them, but I also see good writers psychologically destroyed, little by little, by the pursuit of the unobtainable. It’s time to take the advice I was offered years ago and figure out a way to be at peace with where my writing fits into the big wide world. And for now I’m going to stick with something very simple and concrete. Success means showing up at the page, day after day after day, both on the days brimful of inspiration and the days that are dry. It means writing the stories that clamor at the doors of my imagination to the best of my ability, and sending them out into the world to be read. As for the rest of it – the wheel goes up, the wheel goes down. Nobody knows where it’s going to stop. So maybe it’s time to just enjoy the ride and stop worrying about the destination. What’s your definition of success for your life, whether in writing or anything else? GIVEAWAY! Kerry is offering up a sign copy of WAKEWORLD to one commenter. Comment on this post by noon EST on Friday, February 21st, and you’ll be entered to win Kerry’s giveaway. U.S. addresses only, please. Follow The Debutante Ball on Facebook and Twitter for extra entries—just mention that you did so in your comments. We’ll choose and contact the winner on Friday. Good luck! Kerry Schafer is licensed both as a Mental Health Professional and an RN, and spends most of her daylight hours helping people–usually with a smile. In books, she gets to blow stuff up, preferably with something more interesting than a bomb. Dragons are good; exploding giant slime toads are even better. She has published two novels with Ace Books: BETWEEN, which was released in January 2013, and WAKEWORLD, in January 2014. She is also the author of THE DREAM WARS novellas, available where electronic books are sold. Good point, Linda! While I love the idea of being rich, or even being “home to write full time” I have a feeling that would mean a lot of playing around and not so much writing, when it came right down to it! This is a lovely, thought-provoking post. Thank you, Kerry, for reminding me that success is not defined by numbers, but by the stories themselves. Thank you also for showing up in the mornings – I love BETWEEN and WAKEWORLD, and am looking forward to reading Book #3! Susan – I’m looking forward to reading Book Three too, lol. Which means I’d better get moving ’cause it’s got a ways to go. You’ve put your finger in exactly the right spot, Kerry. I think our writing only makes us happy when we write what we really want to write, and well. Getting the first book deal is a great moment, it’s a validation of what we love to do, but it’s also the point when we have to find a definition for what we believe is our own success. Right now, not feeling so successful — I’ve barely been able to write, maybe only a couple of hours on the weekend what with pre-launch stuff. Ack! Lisa – those who know me will would probably snort at the idea of me being a disciplined person, but then again, maybe I’ve grown into that. Here’s the truth – my attention span is lousy and my will power is weak. But I love to write, I need to write, and I want a publishing career as much as I’ve ever wanted anything. If any of that is going to happen, then I MUST get up in the morning and/or write in my one free hour in the evening, because that is the only time I have. It’s then or never. As for the pre-launch stuff – that will slay your writing like nothing else, lol. Embrace it! A few weeks of fun and insanity and then it will level out again and you’ll be back to your regular writing routine. Well, at least you’re a mental health specialist. Thanks for helping keep the rest of us sane. Um, if you’re relying on me for sanity, I fear we are all in deep deep trouble. Yay, Kerry! We’re so happy to welcome you back to The Ball! I absolutely love this post—so wise & true. It definitely feels like there will always be more milestones, more unobtainables to achieve, which can be a double-edge sword because while that keeps us ambitious, it can keep us from being happy, too. My idea of success is a lot like yours: showing up and writing, and enjoying the act of discovery on the page, time and time again. Because if I don’t continue loving it, what’s the point of all of it?